Contemporary design featuring a rich wood finish with our extra soft seat and overstuffed back cushioning. The Pioneer offers a fresh new attitude to lift/recliners. 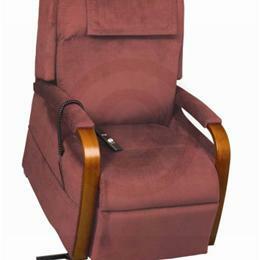 Easy to grasp wooden arms will provide you with more stability while getting in or out of this chair. The seat and back cushions will provide sink in softness for levels of comfort all its own. With its youthful appeal, the Pioneer is the ideal complement for any home or office.